Have you been trying to find the best price on rented storage container in Denver? If so, it is time to give Haulaway, the home of affordable storage containers, a call to receive a free quote and learn about your rental options. We offer an extensive selection of containers suited for construction, business, or residential storage purposes. We offer rapid delivery, often as early as the following day. Upon completion of your project, we will promptly remove the container from your work site. In addition to rentals, we also offer sales of our affordable storage containers. 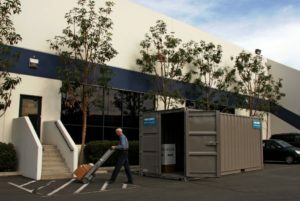 Haulaway Storage Containers began as a small family-run business back in 1968. Since then, we have been proudly providing the western United States with storage solutions. Our containers come in 10’, 20’, 21’, 26’, and 40’ sizes. There are two doors on the 21’ and 26’ containers, allowing for improved accessibility and air circulation, ideal for summer months. These containers are made of durable water and wind resistant 14 gauge steel, ensuring the safety and security of your items. Some of our containers are equipped with our patented Rhino Locking System for extra security. We have been able to provide the best price on rented storage container in Denver for industries such as construction, offices, government, retail, schools, and hospitals. When you seek storage solutions and the best price on rented storage container in Denver, call the storage specialists at Haulaway Storage Containers. We will help find the best possible solution for your specific needs.